The smallest of the Spitz group of dogs, the Pomeranian is a descendant of the much larger sledge-hauling dogs of the Arctic countries. In 1888 Queen Victoria adopted the breed and since then its popularity has soared dramatically. The Pomeranian is a sturdy and robust little dog. He should exhibit great intelligence in his expression, docility in his disposition, and activity and buoyancy in his deportment. His tremendous vivacity and spirit is one of the characteristics of the breed. 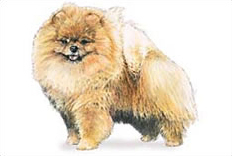 Clean in his habits and easy to train, the affectionate little "Pom" makes a delightful pet. A small house and yard is sufficient, as he does not require much exercise, but do keep him occupied as he has a tendency to be noisy. His two-ply coat, which comes in a variety of glowing colours, needs regular attention. This breed requires gentle handling, and as such makes an ideal house pet for adults. The petite Pomeranian is somewhat of a busybody, being ultra inquisitive and full of his own self importance. He cannot bear to be left out of any fun and games, and thrives on human companionship. Due to his small size he is best suited to adult households or those with older, gentle children. He adores his creature comforts and enjoys the pampered life to the full.